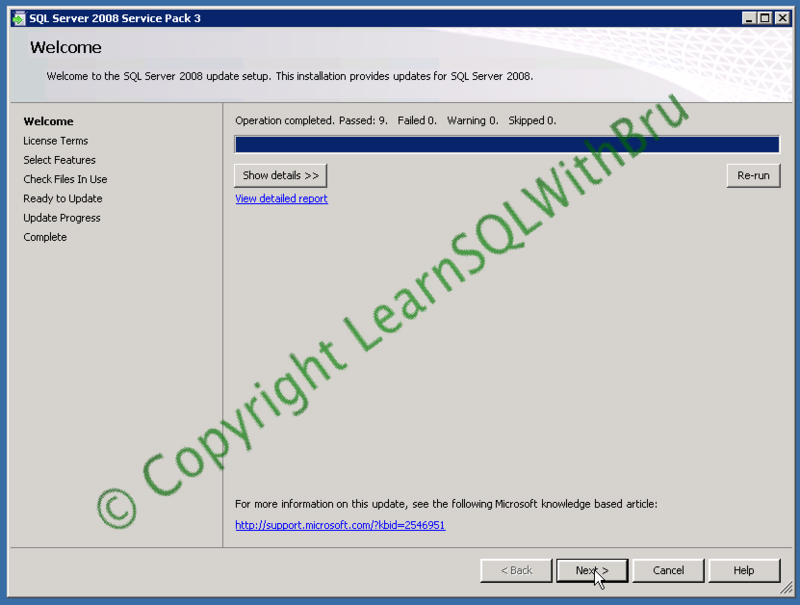 This blog will provide a step by step details of installing SQL Server 2008 Service Pack 3 on more than 1 Instance at the same time. Before going ahead and installing Service Pack, I would recommend you read one of my earlier blogs Best Practices for applying SQL Server Service Packs. 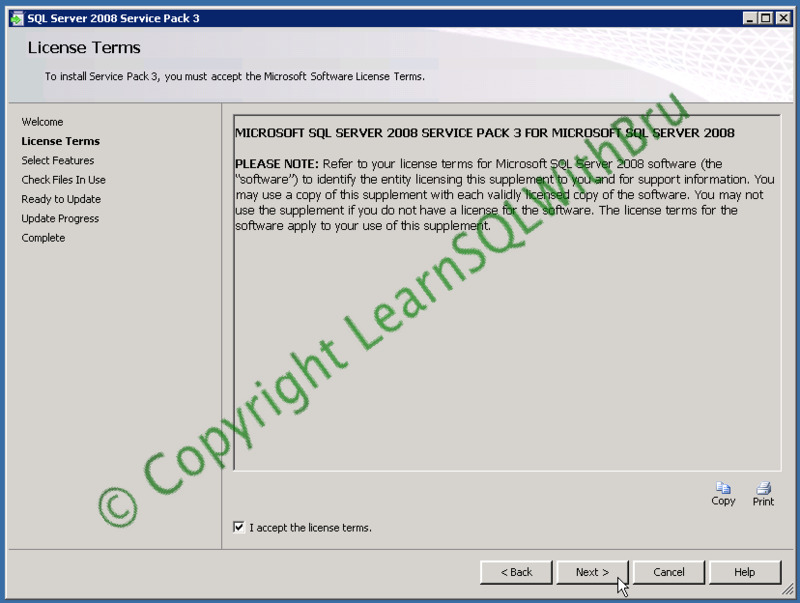 In one of my previous blogs (read it here), you can find where to download the Service Pack, what are the enhancements to SQL Server and few useful links that would assist you in preparation to applying Service Pack 3 for SQL Server 2008. Once you have downloaded the Service Pack 3, copy the .exe file to a local drive and right click on the file and choose Open from the popup menu to begin the installation. (You can alternately double click the file to begin the installation). The exe file take a min or two (depending on your system) and extracts to a temporary location, once the extraction is completed, the below Welcome screen is displayed and the installer performs few checks and displays the below screen. If there are any failures, ensure that the necessary steps are performed. Click Next to continue installation. Accept the license terms by selecting the check box and click Next to proceed. The next step is features selection, where you have to choose the components to which you would like to apply the Service Pack 3. 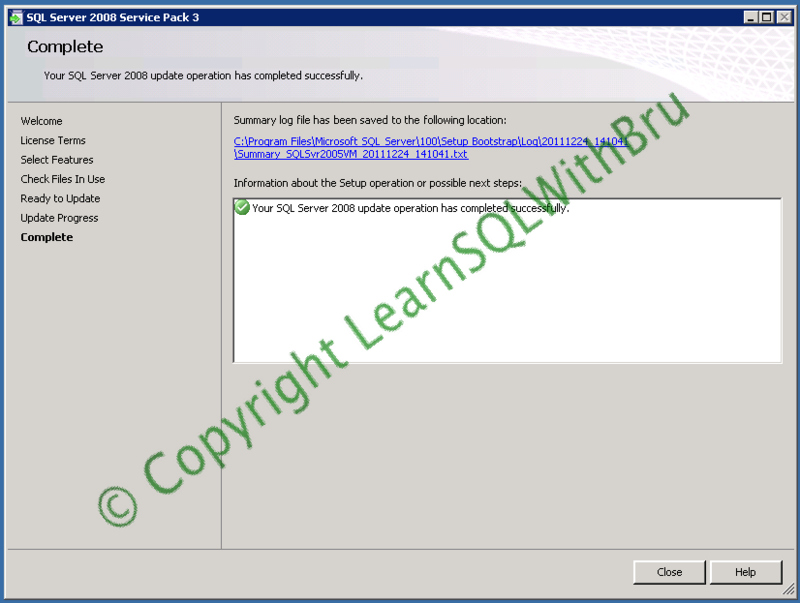 In this blog we are going to apply SP3 for 2 instances at the same time. 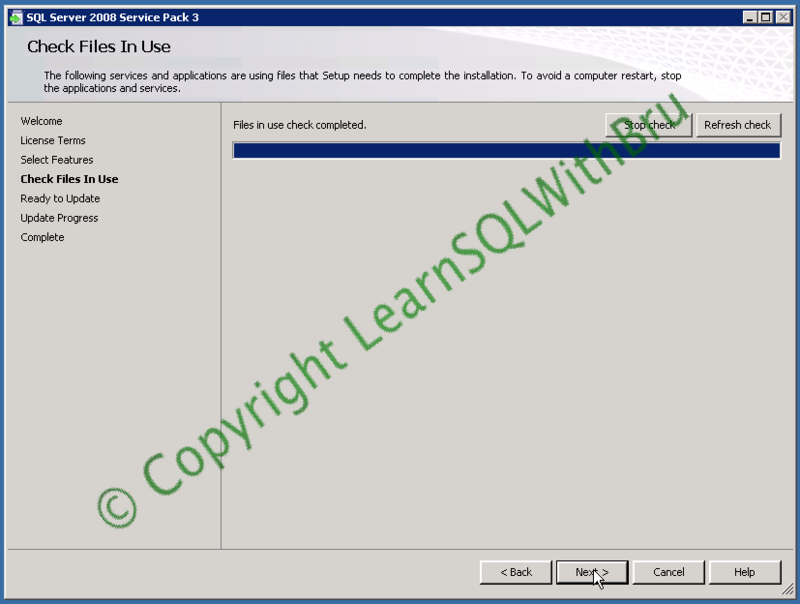 If you have more than 1 SQL 2008 Instance on the machine, you can choose which instance(s) to apply Service Pack. You can select the check boxes beside each of the Instances or if you wish to Install for all Instances / features click Select All button in the bottom left. You can click on the Instance to see the current details of that Instance / feature. 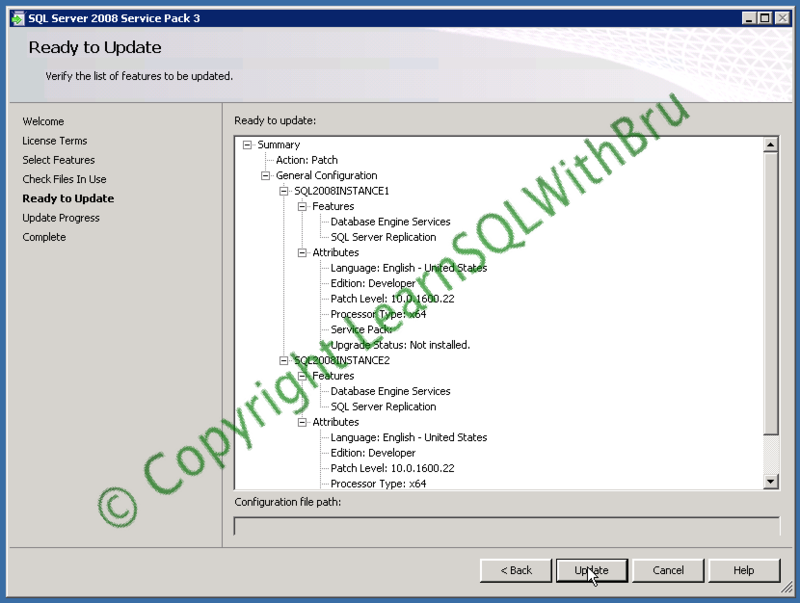 In the picture below, I clicked on the SQL2008INSTANCE1 and the Edition, Patch Level and other details are displayed..
Click Next after you are done selecting the features to be applied with SP3. The next step check for the files / services that are being used currently and lists if there are any files that needs to be stopped in order to avoid a restart. Click Next to proceed. Then the below screen is displayed which shows a summary of features that are going to be updated to Service Pack 3. Click Update to start the SP 3 installation. Once the Installation is done, the installation progress is displayed as below. Click Close to close the Service Pack Installer. 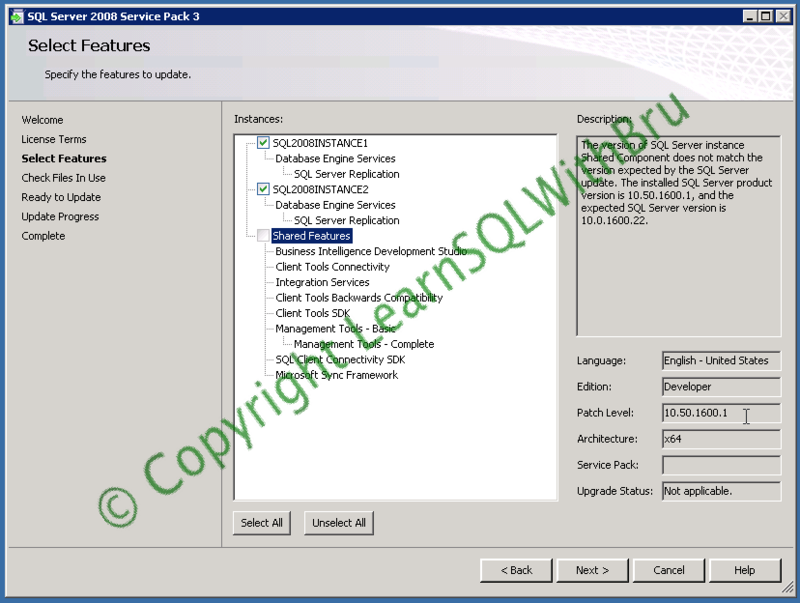 Restart the machine if possible, else the SQL Instance(s) that have been updated with the Service Pack 3. 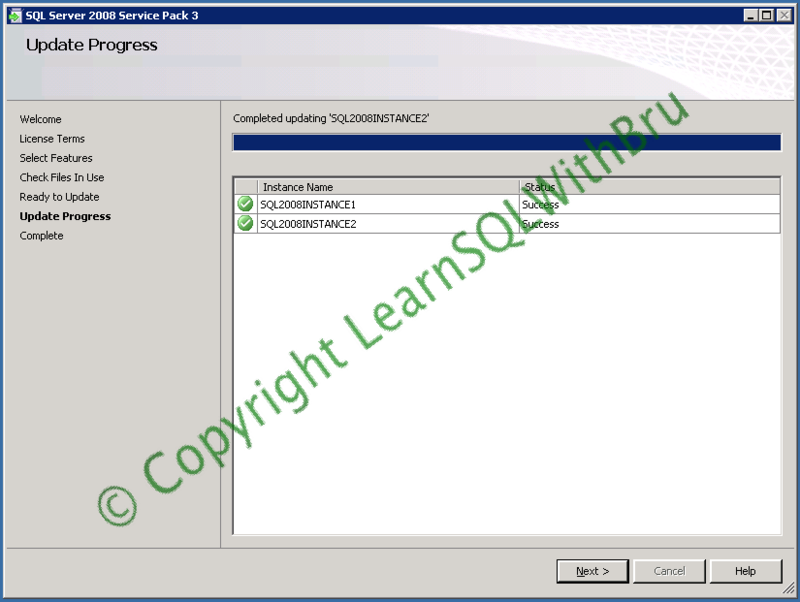 Once the Instance is restarted, you can run the below command to find the Service Pack level of the SQL Server Instance that you have applied Service Pack..
You can see that the result shows (SP3). If you are planning to migrate other database products such as Oracle, Informix, MySQL, Sybase to SQL Server 2008, you should be reading the white papers available on this link. SQL Server 2008 Migration White Papers from Microsoft Download Center. 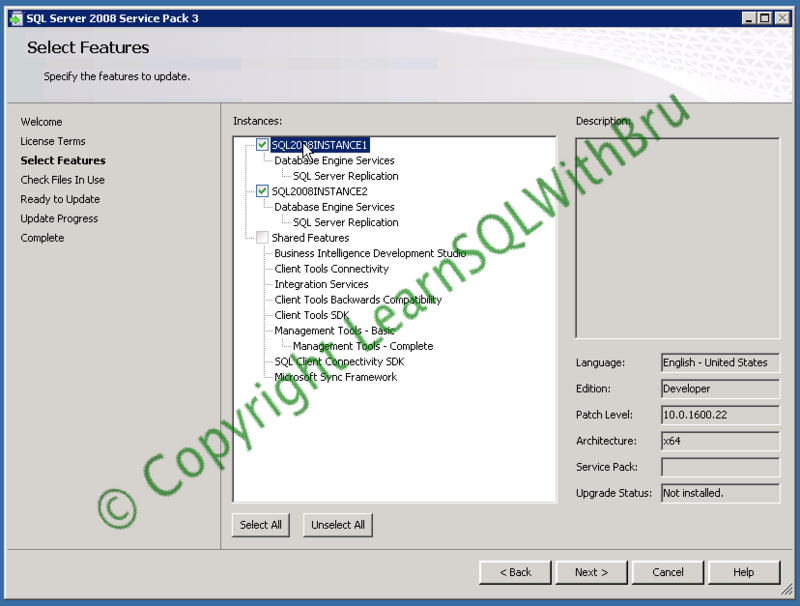 The documents will provide an overview of the non-SQL Server database Migration to SQL Server 2008 and how the SQL Server Migration Assistant (SSMA) will assist in conversion of those database objects to SQL Server database objects. What data types would be a good match on SQL Server. The next method to find the SQL Server start time is finding it through the Windows Event log viewer. Explaining the details of how to open a event log viewer (with pictures) is beyond the scope of this blog. So let me give tell you in short steps. Right-click your computer and choose manage. Under System Tools, expand Event Viewer, choose Windows Logs. Once you are in Windows Logs, choose Application. The main secion of the console displays the events from various applications installed on your server. 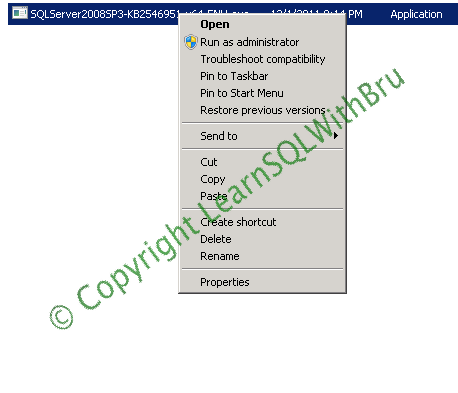 A SQL Server startup information is displayed as a shown below. The main problem of finding the SQL Server startup information this way is difficult, since you have to go through th list of events.. Since I am aware of the startup time, I could go straight to that date and time in the application log. This is another way and the most easiest way to find the SQL Server start time and date. The information is readily available by querying the dynamic management view sys.dm_os_sys_info. The column name is sqlserver_start_time. This dmv has been there in SQL Server 2005, but the column sqlserver_start_time is added starting from SQL Server 2008.